There are many clichés in football like “Your only as goods as your last game”, “Good Feet for a big man”, “They are too good to go down” (rubbish no team can ever be too good to go down), “The league table never lies” (this is in fact true). 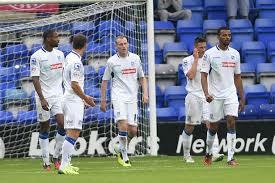 The 2014/15 season was a dark season in the history of Tranmere Rovers when after 94 years (1921 – 2015) as a football league team they finally bowed out after what had been a horrendous few years going from the top of league one and the verge of promotion back to the championship which ironically was the highest league they got to in the 94 years to relegation out the football league. This is not unusual nowadays its been seen before in recent season with Luton Town, Barnet and Bristol Rovers dropping out the league but all 3 teams have now regained league status having been achived fairly quickly something I am hoping Tranmere can achieve although in recent years no team has bounced back the following season after dropping out the league unless Bristol achieve this that is via the conference play offs , although there have also been cases in recent years of established league clubs like Wrexham, Grimsby, Chester & Darlington who have failed to regain league status after a few seasons and in the cases of Stockport County & Chester they dropped down another tier in the conference ladder although this was mainly due to financial difficulties. One of the major questions for any newly relegated club is will they be able to survive financially? Although I am confident Tranmere can, I say this due to the apparent financial support from the clubs new chairman who is a former Rover’s player and FA Chairman Mark Palios who has invested more money in the time he’s been in charge at the club than the previous chairman Peter Johnson invested in a good few seasons & the clubs season ticket price structure for the coming season which will put Tranmere in the middle of the conference pricing table. Tranmere Rovers have been truly awful this season so they cant really complain about relegation IMO, It started badly after relegation to league 2 by appointing an unknown manager in Rob Edwards in the summer of 2015 who was a number 2 at Exeter and who had never been a manager before appointed by former chairman Peter Johnson, Tranmere also lost the services in the summer of some key players like Ryan Lowe who was the clubs top scorer the previous season, Ash Taylor a young local centre back who was also starting to show promise as a possible replacement for another Rover’s hero and stalwart Ian Goodison who wasn’t offered an new deal either that summer much to many of the fans dismay & Steve Jennings a combative midfielder who was resigned initially on loan in the 2014/15 season then on a short term contract during the season. Johnson’s reluctance to provide the new manger Edwards with a competitive enough wage budget to retain these players and attract a good calibre of new player was instrumental in the demise this season. Although PJ never invested much money in the team over the years he did run the club well in the sense that the club never really haemorrhaged money or drastically overspent each season like some clubs have recently and when he did eventually sell the club he wrote off the debit he was owed approximately £5m but don’t get me started on this as I have separate views on if this figure is genuine , that aside failure to invest was probably the major factor in the demise although hindsight is a wonderful thing. Rob Edwards appointment failed and after only 14 games (W2, D4, L8) was sacked by the new chairman Mark Palios as the club was already in danger at the bottom of L2 and with a squad that looked desperately low on confidence MP made the change and brought in an experienced manager in Micky Adams. Adams soon set about reshaping the team releasing players James Rowe, Elliot Richards & Abdulai Bell -Baggie and bringing in his own, players like Steven Jennings (former player), Adam Dugdale, Josh Thompson, Rob Taylor, Lee Molynuex and various loan players, in fact by the end of the season Rovers had used 47 players all season am not sure but that’s got to be a club record! Adams reign started well although he never won games he started picking up valuable points and with 10 games to go Rover’s had managed to pull out relegation places but things turned around again with rover enduring a terrible next 8 games losing points in keys games against relegation rivals in fact they only picked up 1 point against Hartlepool from the teams around them and they didn’t really deserve that point after they where out played by a resurgent Hartlepool team under the guidance of former Rovers Manager Ronnie Moore, with 2 games reaming and Rover’s at the foot of the table after a 0-3 home defeat to Oxford Adams and Tranmere agreed to part company Adams record was 37 games 10 wins, 11 draws & 16 defeats with Rovers appointing assistant manager and former player Alan Rodgers & academy manager and another former player Shaun Garnett in temporary charge for the reaming 2 league games against Plymouth Argyle away which Rovers lost 3-2 gaols from Max Power and Kayode Odejayi the two players (between the pair they have had the most goals, assists etc) that have single handily tried to save Rovers season albeit on there own and with Hartlepool winning at home to Exeter relegation along with Cheltenham was confirmed Rovers last game was then at home to promotion chasing Bury in the final game of the season a game that a Rovers fans at the start of the season had hopped would be a game to decide who clinched the title! But as it turned out it was Bury who secured automatic promotion with a 1 nil victory on the final day of the season. 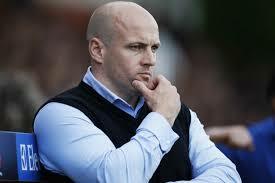 On the 5th of May 2015 moved quickly to secure Adams full time replacement when they appointed Former conference manager of the year Gary Brabin who was working as a coach with Everton’s academy having previously managed Cambridge, Luton & Southport. If Tranmere are to bounce back quickly they will need to address one of the issue that have been a major thorn in the clubs side over the past few years and that is defensively, rovers have been absolutely awful in this area from being unable to defend set pieces to just dropping deeper all the time, in my opinion the club needs an experienced defender that can organise the rest of the back four, if it happens remains to be seen. 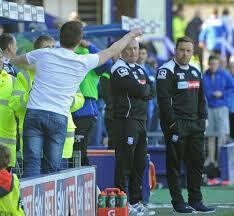 Tempers Rise at Prenton Park as a fan takes out his frustration on Micky Adams before he was eventually sacked by Palios.